Happy Valentine's Day from Fuse! 2/10/2009Share this story on Facebook! Love is in the air at IC, and there are plenty of activities all over campus to remind you that Saturday is the big day. This week the Thursdays at the Handwerker series will present newly composed Valentine’s Day music based on poems written by Ithaca College students. 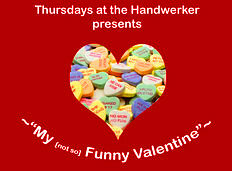 “My [not so] Funny Valentine” will begin at 6:30 p.m. on February 12 in the Handwerker Gallery. Or, if you want to give to your valentine and the campus, purchase a flower at the R.E.A.C.H. (Responsibility, Education, and Action for Campus Health) carnation sale, which will be held in the Campus Center lobby on Friday, February 13 from 10:00 a.m. to 3:00 p.m. The Art Club will sell hand-made Valentine's Day cards in front of Grand Central on February 10, 11, and 12, from 10:00 am to 3:00 p.m. The cards are only three dollars each. Maybe you feel like getting married on Valentine's Day? Head to the North Foyer on February 12 between 9:00 a.m. and 3:00 p.m., and let Created Equal marry you and your valentine for just five dollars. You'll even get a complimentary picture and two ring(pop)s! When in doubt, go for the tried-and-true and give candy! The IC Hip Hop Dance club will deliver a personalized candy-gram to your special someone for just a few dollars. Members of the club will take your order from 10:00 a.m. to 3:00 p.m. in the Campus Center, February 11, and in the North Foyer on February 12. Last but not least, you can support your classmates traveling to the Dominican Republic by purchasing a Secret Valentine Gram. On February 11 and 13 in the Campus Center and on February 12 in the North Foyer, you can buy a Valentine Gram for three dollars, decorate it, and enclose a secret message. It will be delivered to your valentine for you. The Culture and Society class (Sociology 312: An International Field Experience) will travel to the Dominican Republic to learn about community organizing and social change. Happy Valentine's Day from all of us at Fuse!